"Lansdale is an immense talent." -- Booklist. Small-town juvenile delinquents, Pentecostal snake-handlers, zombies, psychopaths, and assorted freaks populate these witty and gritty tales of horror by a master of the genre. The suspenseful, action-packed tales range from visions of a post-apocalyptic world ("Tight Little Stitches in a Dead Man's Back," "On the Far Side of the Cadillac Desert with Dead Folks") to alternative histories ("Trains Not Taken," "Letter from the South, Two Moons West of Nacogdoches"). A dozen other stories of gruesome violence and utter depravity include "The Pit," in which car trouble develops into a life-or-death struggle; "Night They Missed the Horror Show," involving an encounter with ornery rednecks; and "Hell Through a Windshield," in which a drive-in movie provides a one-way ticket to another dimension. 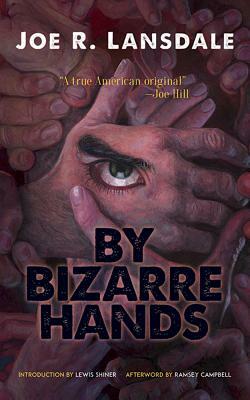 By Bizarre Hands, Joe R. Lansdale's debut collection of short stories, was nominated for a Bram Stoker Award for Best Fiction, and two of its tales have received Stoker awards. Lansdale's novella Bubba Ho-Tep was adapted into a 2002 film, and his Hap and Leonard detective stories inspired the Sundance Channel television series. This edition features an Introduction by science-fiction novelist Lewis Shiner and an Afterword by horror fiction author Ramsey Campbell. Suggested for mature readers. The author of more than forty novels and numerous short stories, Joe R. Lansdale has written for comics, television, film, newspapers, and Internet sites. His novella Bubba Ho-Tep was adapted into a 2002 film and his Hap and Leonard detective stories are being developed into a Sundance Channel series. Lansdale's numerous honors include eight Bram Stoker Awards.